Every Waghorn bass guitar is built from only the best quality tonewoods and each is genuinely handcrafted with the greatest care and attention to detail. We offer several original body and headstock designs as well as our own variants of a few classics due to popular demand. We build every guitar by hand, not CNC - so creating a unique design or even modifying an existing design to meet your exact requirements is easy. We can work with you to design and build your perfect bass, both tonally and aesthetically. Every Waghorn bass is made to order and as a result the construction style options available are numerous. We build Through-Neck, Set-Neck and Bolt-On neck guitars; with either a solid, chambered or semi-hollow body to achieve the tone you require. All of our guitar necks are made from quarter-sawn timbers, and with volutes at the headstock for strength and stability. All necks are fitted with two-way truss rods and feature carbon-fibre neck reinforcement as standard. We build four strings, five strings, six strings and beyond, with your choice of scale length including custom and multi-scale (fanned fret) instruments. If you have a specific tuning in mind and are unsure what the best options are you can contact us to discuss the technical and ergonomic aspects of different scale lengths and resulting string tensions. We utilise high quality guitar hardware from companies such as Schaller, Gotoh, ABM, ETS, Kahler, Hipshot, Graphtech, Sperzel - to name the most popular. The specific hardware available of course varies from year to year so for more information get in contact with us or see individual manufacturer websites. We do not use cheap substandard hardware from the Far East. Pickups from companies such as Seymour Duncan/Basslines, Delano, DiMarzio, EMG and Nordstrand and (as well as others) are widely available to suit your tone and style. Active and Passive EQ systems Switching and wiring options of course depend largely on the pickups and controls that you choose but we are able to discuss what sounds or switching patterns you hope to achieve and if it's possible - we can do it. We can also implement midi and piezo systems from companies such as Graphtech. We offer two main clear coat finish options; Gloss and Satin. Both are essentially the same finish, but the Gloss will typically receive more coats and undergo more sanding before polishing to a high mirror gloss. Our necks are finished in Satin as standard for a super fast feel, but Gloss is an option if you wish. We can also produce oil finishes depending on the hardness of the woods used. Take a look at our bass guitar gallery to see previous examples of natural, dyed, solid/block colours as well as different combinations that we have produced in the past. Waghorn custom bass guitars start at £1550.00 GBP for bolt-on, £1650.00 for Set-neck construction, and £1750.00 GBP for neck-through. For a more detailed quote for your ideal custom guitar specification complete a Bass Guitar Custom Quote Form or call +44(0)117 927 2111. Click on the models below to see examples and design options. 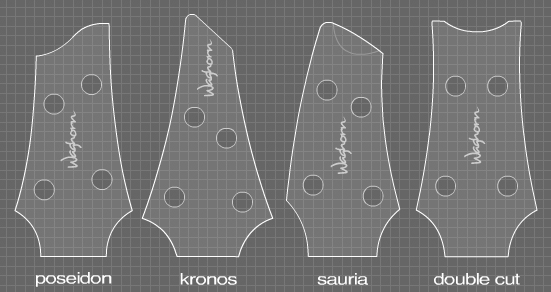 The headstocks shown here are the signature for each body shape, but can be swapped for another of our headstock designs if you prefer. All of our non-symmetrical designs available in Standard or Reversed format, and headless construction is also available. All of our designs are available as 4, 5, 6, 7 or 8 string and beyond (depending on suitable quality hardware). Talk to us to discuss your ideas. We also offer the majority of our electric guitar shapes as bass models!